Grunge, everyone loves a bit of it and I’m no exception. Today’s freebie is a set of 10 high resolution grungy surface textures – enough to satisfy the grunge-lover in all of us. 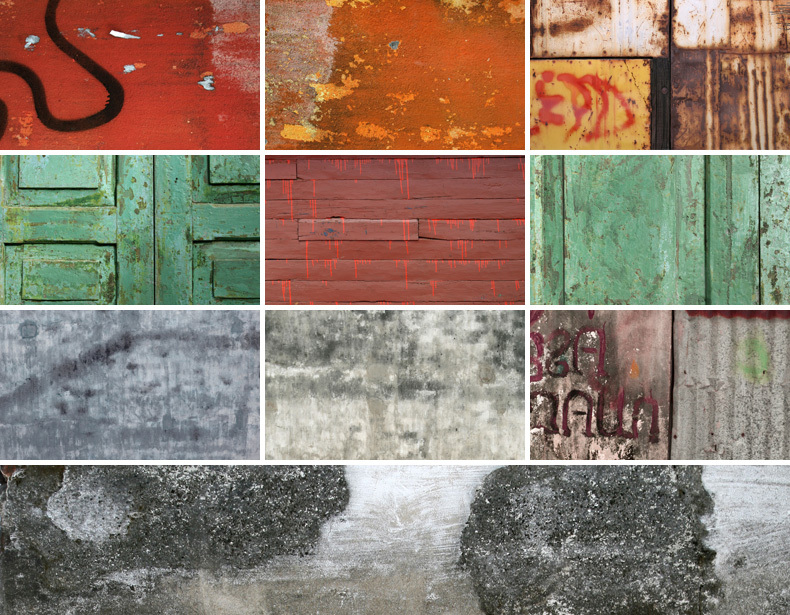 Kindly donated by Michael Hylton, these textures were spotted and snapped whilst travelling the globe. Each texture (jpg) is a whopping 2500px x 1667px in size – plenty of options there! Don’t forget to share the wealth and make sure you check out more of Michael’s work! Awesome backgrounds, thought I’d post after your tweet! These look very impressive! Thanks! Thanks Orman for the nice set of textures. The second one in the top row is just superb! Did you take snap of all of theses or they are photoshoped? I actually didn’t snap any, Michael did. They are indeed all snaps tho, not ‘shopped. Any chance you have the specs on the camera he used? Hi Nick – at the time I was shooting with a Canon 400d and most of these would have been taken using a Tamron 17-50mm 2.8 lens with circular polarising filter. Really nice texture collection, Orman. Downloaded! Great set of textures! This reminds me I need to carry my DSLR with me more often. Thanks for the download. Cunning plan worked. Oarsum site ! Only just discovered you. Will be revisiting and following often. Thank you. Have you used these textures in any of your work? Anything public that you could show off? These images are great but it’d be icing on the cake to see how they’re used! Very nice work, and HERE HERE I second that motion! Got any examples? Thanks again! I haven’t used any of these particular textures just yet, setting up a showcase for resources in the wild seems like a good idea. I like it Steve! I usually try to publish an inspiring quote with some nice background art every so often on my Twitter stream so today I’ll work on one using these textures. I like it, do it do it! Great selection of textures, looking forward to trying a few out! I have a ceramic tile and I want to make a high resolution photo to publish on web. I will be thankful if you give me some tips about photography. I have made a few photos the surface is shiny. The images do not demonstrate what they are really.